I'll bet George Bernard Shaw had just gotten home after partying with a bunch of 50-something friends complaining of neck, knee and back issues when he penned his now classic quote, "Youth is wasted on the young." I’ll bet he was also suffering from a host of aches and pains himself when he lamented his lost youth with so memorable a phrase. But, while I understand the essence of Shaw’s words, I sure don't subscribe to them. 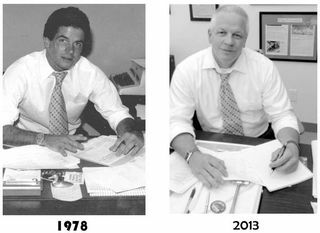 That's because, as I turn 59 this Sunday, I'm enjoying a much fuller and more rewarding life now than I did ever did as a youth (Note the side-by-side photographs of Repman today, and his 24-year-old younger self). When I was 24, I had no real idea about the world at large, emerging trends or what was, or wasn't, important in my newly-chosen profession. Sure, I knew how to write a press release, generate placements and manage a client relationship. But, beyond that, I was clueless. I had no real opinions about politics, business or technology. My focus was work and women. Period. I considered myself physically fit, but did little more than run a few miles every day. And my diet rivaled that of the pre-stomach band Chris Christie’s. Believe it or not, I feasted on a steady diet of McDonald’s and Devil Dogs. The 24-year-old me would have never contemplated mountain climbing as a pursuit. It simply never entered my consciousness. Today, though, I can say I’ve successfully summited mountains in the Alps, the Andes, the Rockies and Tanzania. The 24-year-old me wouldn’t have been up to the physical, mental or emotional demands needed to climb the Empire State Building much less Mt. Kilimanjaro. As a young man, I envied the likes of Johnny Carson, George Carlin and Richard Pryor. But, I never would have thought of performing stand-up comedy or improvisation in front of a live audience. I simply didn’t possess the self-awareness, self-confidence and self-deprecating sense of humor necessary to succeed on stage. Now, I perform all the time and all over the country. And, back in 1978, I positively adored Muhammad Ali. But, I never would have contemplated putting on a pair of gloves and learning to box. Now, I do it twice a week. The young Repman could never have churned out a fresh blog on a daily basis either. I wouldn’t have known where to begin. Ditto for my column on Inc.com. I simply lacked the intellectual depth and rigor. So, Mr. Shaw, I must say that I vehemently disagree with your observation. Youth isn’t wasted on the young. At least not all the time. And, certainly not in my case. I’m hoping there are others who agree with my disagreement. Either way, I'd love to hear from readers of a certain age. Do you agree with me? Or, like G. B. Shaw, do you feel youth is indeed wasted on the young? I'm interested to know if a recent phenomenon that's swept the Peppercomm workplace is occurring simultaneously in other office cultures, near and far. The event in question is, for lack of a better description, a lengthy farewell e-mail from a departing employee that is sent agency-wide on the individual's final day of work. These departure e-mails aren't just, “Gee, it's been real…” notes. Rather, they rival War and Peace in scope, and cover every conceivable event or experience that occurred during the employee's tenure at our firm. Some will recall good clients and bad. Others will regale us with tales of their very first business trip. Still others will wax poetic about a Summer party from 2009. I'm not sure exactly when these missives began, but they've become part of our standard operating procedure. I addressed the phenomenon at our management committee meeting this past week, and noted that a departure note or e-mail simply never occurred at the Hill & Knowlton of the 1980s, the Earle Palmer Brown of the early 1990s or the J. Walter Thompson of the mid-'90s (my previous employers). Nor did it occur at Peppercomm until recently. Our creative director suggested it was a Millennial 'thing' since, he noted, they love to comment on every occurrence in their lives up to, and including, their most recent employment experience. Our licensing director saw the phenomenon as a positive trend. Which it may very well be. Good or bad, right or wrong, I'm nonetheless beyond curious as to WHY this occurrence has suddenly materialized. Why do departing employees feel the need to share very personal experiences with every other employee? I'm at a loss. I'm also at a loss as to why each departing staffer feels compelled to include new contact information (since they're all already connected). 1.) Why write an all-hands departure e-mail in the first place? 2.) Is this phenomenon unique to Peppercomm, or is it part of the ever-changing American workplace? If you're nice enough to enlighten me, I'll be sure to list you as an asterisk at the bottom of my departure sign. 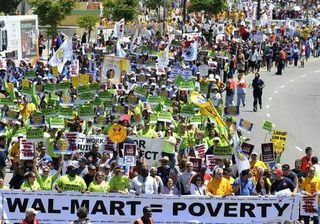 While Wal-Mart stores in Miami, Boston and San Francisco endured a weeklong employee strike in May and Amazon's Leipzig, Germany, facility staged a similar walkout demanding higher pay, Costco Wholesale, America's second largest retailer, continued to sail serenely along with a remarkable turnover rate of only five percent among workers and less than one percent with executives. In fact, Costco is positively thriving. Sales are up a whopping 39 percent over the past five years and the stock price has doubled since 2009. Why? Unlike the House of Mr. Sam, Costco pays hourly workers as average of $20.89 per (as compared to Wal-Mart's hourly rate of $12.67 per). Eighty-eight percent of Costco employees also receive company-sponsored health insurance (Wal-Mart claims “…more than half its employees do.”). And, drum roll please, Costco has no problems with unions. 'They are philosophically much better than anyone else I've worked with,' says Rome Aloise, a Teamsters vice president. Compare that with Wal-Mart's positively hostile attitude towards unions and union organizers (which was documented in 'The high price of low cost.'). So, why is Costco so employee-friendly when Wal-Mart, and the rest of the retail industry, treats them so like so much chattel? Shocking, no? Well, it is unique, at least in retail. “Most retailers see their employees as a cost to be minimized and typically end up underinvesting in them,” says Zeynep Ton, an M.I.T. professor. That ends up creating the scenario we've all experienced at just about every Wal-Mart store one can name: “…surly employees in stores engulfed in chaos, (and) an environment that makes ordering online look a lot better,” notes Ton. And how, exactly, is Wal-Mart dealing with surly cashiers? Replacing them with 10,000 self-service checkout systems. As you might expect, Costco doesn't seen any benefit in replacing humans with machines: “(Our) employees do the work more efficiently,” states Jelinek. Of course they do. Because Costco cares about their employees. Wal-Mart, and the rest of the retail industry sees workers as a necessary, and expendable, evil. And, that my friend, is today's tale of two retailers. You decide which model will win in the long run. Am I predicting a world without Wal-Mart? Stranger things have happened. P.S. : Wal-Mart pays multiple public relations firms millions of dollars annually. Costco doesn't see the need for outside PR counsel. Buy! No, Sell! Wait…Buy…er, Sell…Sell it All! Today's guest post is by long-time stock market watcher and long distance cyclist, Peppercommer Matt Purdue. In public relations, the first rule is simple: the more you know about your client's business, the more valuable you will be to your client. So what are they concerned about? Right now, almost every business if freaking out at least a bit over what's happening in the world's financial markets. The stock markets are hopping around like a kangaroo with ADHD, and no one seems certain where they're headed next: up (bull) or down (bear). So what's going on out there? Let's discuss. Assumption #1: if demand increases for a finite thing, the price of that thing will rise. Well, everyone knows the world economy has been having a hard time getting back on its feet since the global meltdown that began in 2006. So to help the economy, the US Federal Reserve (the Fed) has essentially been printing money to buy bonds — $85 billion worth of bonds each month. The Fed is thus creating artificial demand, which keeps the prices of bonds and other assets such as stocks rising (see Assumption #1). And rising asset prices are supposed to make the companies and investors that own these assets more confident. Ideally, this will spur them to spend money, hire more workers, produce more widgets, build more buildings and, thus, boost the world economy. Well, the Fed can't keep buying bonds forever. At some point, the baby has to give up the bottle and hit the sippy cup. Someday, the Fed will decrease and stop its bond-buying program. The BIG question is when. When will the Fed dial down demand? And when it does, will asset prices fall…and destroy confidence? This week, the Fed chairman, Ben Bernanke, suggested that the Fed could slow its bond buying binge later this year and end it in the middle of next year — if the economy continues to improve. After Big Ben's press conference, the markets reacted…er, overreacted. Mommy told the baby that someday she will have to give up the bottle and use the sippy cup…and now the baby is going apesh*t, throwing its toys and screaming its bloody head off. In the U.S., the Dow Jones Industrial Average fell more than 500 points last Wednesday and Thursday. Stocks around the world also pummeled. So what's next? It's hard to guess. As I write this on Monday morning, the Dow is down another 1.5%. If I were a betting man, I'd wager on more volatility in global markets until investors have a better idea of which way the wind is blowing. Advertising Age's interview with the legendary Shelly Lazarus is a MUST read for any aspiring marketeer, industry veteran or someone who is simply lost at sea. Lazarus, who is currently chairwoman emeritus at Ogilvy & Mather, confesses she had no idea what to do with her life after attaining her master's degree. It wasn't until a headhunter called and persuaded her to take a copywriting job at O&M (which was looking for a copywriter with hair care experience) that Shelly struck gold. Lazarus says she found a place where she loved what she was doing every day. Shelly advises young people (or those at sea) not to stress about not having a career plan. “The advice I give is you have to recognize an opportunity, and then if it feels right, if it feels good in your stomach, just jump. Chances are, it'll be right,” she said. Like Shelly, I had no career plan when I graduated from Northeastern University with a B.A. in journalism. 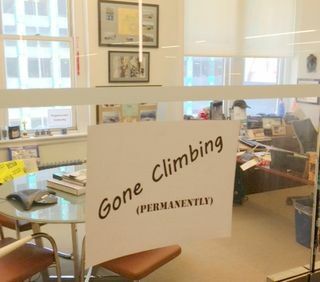 Two years of relevant work experience in the newsrooms of The New York Times, CBS Newsradio and WGCH Radio in Greenwich had taught me two things: I loved news and newswriting, but hated the cynical, back-stabbing culture of the newsroom. 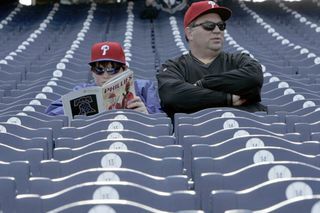 So, I asked Bill Kurtz, my N.U. professor, for advice. “Have you thought of PR?” he asked. “What's that?” I responded (at the time, N.U. didn't offer a single course in the field). Long story made short, Kurtz advised me to read back issues of O'Dwyer's Newsletter, compose a cover letter and start reaching out to PR firms. Like Shelly Lazarus, I struck gold at Hill and Knowlton. Like Shelly, I went over there and kind of fell in love (but, I didn't stay). What did stay, though, was my love of public relations. It took Shelly Lazarus a while to find her passion. Ditto for me. And, ditto for many of you. So, take it from arguably the most successful woman in advertising history: you WILL find your passion. Just listen to your gut. 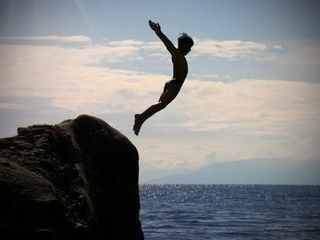 If it feels good, jump! Today's guest post is by Peppercommer Catharine Cody. 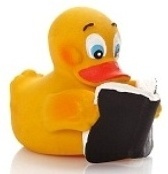 I’m kind of an odd duck for my generation. My clock radio (which is older than I am and inherited from my parents' guest bedroom) wakes me up every morning to Soterios Johnson on NPR’s Morning Edition. While I’m sipping my coffee and deciding what to wear, I’m learning about President Obama’s G8 Summit and the NSA PRISM controversy. Along those same lines, when the Kindle and Nook started to gain popularity a few years back, I did not jump on board. Books are even available on iPhones now, but my e-newsstand is blissfully empty. I refuse to buy into that trend. So, when I decided to buy a year’s subscription to TIME magazine, people were a little surprised I opted for the print copy and not the iPad app. The thing is, I like the feel of paper in my hands. I don’t care that the iPad apps are interactive, or that you can easily look up words you don’t know on Kindles and Nooks simply by double tapping on them. I’m old school. If I don’t know what a word means I (GASP) look it up in a dictionary. An ACTUAL dictionary, not dictionary.com. Call me crazy, but I sometimes even try to figure out what an unfamiliar word means by using context clues. When I go on vacation, I pack a few books (hard and softcover) to read. When I’m reading the morning’s headlines, I’m reading the print New York Times, AM New York and NY Metro. I like getting ink stains on my fingers. In fact, every ink-stained finger is a black badge of honor. So, when I saw the cover of TIME Magazine a few weeks ago about the Millennial Generation, I absolutely HAD to buy it. And guess what? I read the entire issue cover to cover. The magazine has amazing graphics to illustrate their stories. As a former graphics production assistant for MSNBC, I understand that these graphics are used to make the content really come to life. The next week’s edition of TIME Magazine about China looked just as cool- so I bought that, too. And then I decided, I might as well just bite the bullet and buy a year’s subscription to the publication. Now, for a meager $23/year, I will have every issue of TIME delivered right to my doorstep. Winning! Not only do I feel really cool among my peers who also commute each day by reading TIME Magazine, but I’m also able to bring new ideas to the table at work. Last week’s issue had an article about classroom technology and a new platform that’s making it easier for kids to have one-on-one training instead of a “one size fits all” approach. One of my clients is trying to break into the education technology industry. Not only was I able to flag this article for my client, but my team members at work were impressed that I even thought to bring it up. Handheld e-readers may be easier to handle while commuting, and less cumbersome, but come on- it’s a joke. One of the best, and most cathartic, parts about reading something is that you are able to see how far you’ve gone and how much you have left. How am I supposed to highlight an interesting part of an article in TIME on an iPad? How am I supposed to take notes or mark literary references in books without a pen? So, the next time you think that all millennials are ruining America with their new-fangled technology and “Devil may care attitude,” think of me, the girl who’d rather stay in bed and read than go out and drink on a Friday night. I swear it’s JUST as cool. I'd be remiss on this Father's Day Monday if I didn't give a major shout-out to my third child, Peppercomm, for winning two Silver Anvils last Thursday. 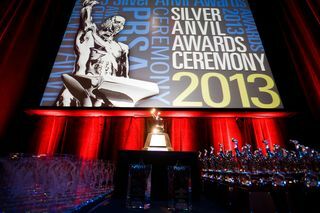 The PRSA's Silver Anvil is the public relations industry's answers to Hollywood's Oscar. And, while we also have our versions of the Golden Globe, Tony and others, the Anvil reigns unchallenged as THE most sought-after trophy. In fact, it's not a stretch to say Peppercomm owes some of its success to the Anvil. Back in 1997, we were still a small, virtually unknown start-up with one or two blue chip clients and many, many more tiny ones. One of the latter, however, a dotcom known as Money Talks, enabled us to shine. We had two terrific clients by the names of Larry Thomas and Julie Farin, who let us do amazingly creative things to break through the Wild West-like clutter that existed back then and establish the personal finance website as a trusted source of advice. 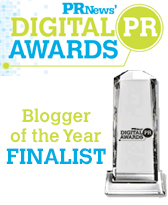 We were rewarded for our efforts by winning the very first Silver Anvil in the 'Internet PR' category. The Anvil win established Peppercomm as a credible player and, of equal importance, attracted a veritable horde of cash-rich dotcoms wanting us to do for them what we'd just done for Money Talks. Thanks to that long-ago Anvil win, we were also able to attract the likes of Steelcase, Aon and General Electric, all of whom yearned to partner with a savvy 'click-and-mortar' public relations firm. And, thanks to Steelcase, GE and a few other ‘real' businesses, we were able to survive the dotcom bust a few years later. So, I'd like to thank the PRSA judges, our agency teams who brought home the awards and, of course, all the folks behind the scenes who made winning these prestigious awards possible. Winning two Silver Anvils makes this father one very proud poppa. Bear with me for a minute, but Katie Couric reminds me of Civil War Hero Robert E. Lee. I'm reading a page-turner of a book about the battle of Gettysburg entitled 'Gettysburg The Last Invasion'. The book was released in time to mark the 150th anniversary of the North American continent's bloodiest battle ever. – As Lee's three corps crossed the Rappahannock River, headed north into Maryland and entered Pennsylvania, they seemed absolutely invincible. Indeed, Lee was convinced one more Confederate victory would force Lincoln to sue for peace. And, he had every reason to believe he would win. In two fierce years of engagements with the North, his army entered Gettysburg undefeated (Antietam was considered a stalemate). 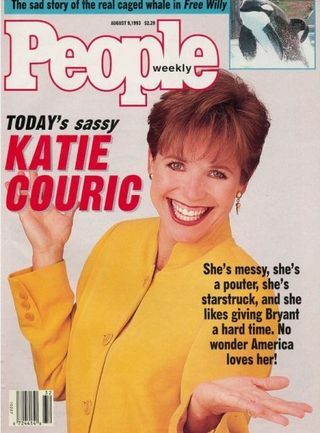 Likewise, from the time she joined The Today Show as an oh-so-cute, oh-so-perky co-host to first, Bryant Gumbel, and later, Matt Lauer, Katie became an unstoppable force. She was almost immediately crowned the queen of the morning talk show circuit, and reigned unchallenged for years. – Lee then committed a series of unexpected blunders during the course of the three-day battle at Gettysburg, culminating in the complete disaster that was Pickett's Charge. Katie made the unbelievable blunder of thinking she somehow possessed the journalistic chops to sit in the same CBS Evening News seat that had been occupied by the likes of Edward R. Murrow, Walter Cronkite and Dan Rather. In my opinion, her sole accomplishment as CBS News anchor occurred when she eviscerated the brain-dead Sarah Palin just before the 2008 election, 'So, you can't name a single book or newspaper that you've read?' asked a befuddled Katie. 'My people give me things. I don't recall their titles,' responded the thoughtful Alaskan soccer mom. The CBS Evening News became Katie's Gettysburg. She was soundly defeated. Viewers quickly saw through the thin veneer, realized the woman lacked the necessary gravitas and began channel surfing. I actually predicted at the time that Katie would end up as an afternoon talk show host of the Oprah variety. And, she did. And, now, just like Lee in the years after Gettysburg, Katie is losing again and again. According to a New York Post article, Katie's show may not even make it to a third season (insert link). The reasons why include a lack of direction and strategy, "…staff weirdness' (that can't be good) and "…no one making decisions." And, as is true of Katie herself, one critic said her show was "struggling…to find a balance between fluff and news." Industry watchers are speculating that Katie might join CNN, which would be ironic since Sarah Palin has just joined Fox News. Maybe the two could re-engage in mortal combat as a far fluffier, more banal version of the Bill O'Reilly – Jon Stewart wars? Katie's brand is battered and bloodied because she lost sight of her strengths and tried to be someone she wasn't. And, thanks to the passage of time, she simply can't get away with just her cuteness anymore. That may seem chauvinistic, but I'd say the same of any male personality who suddenly tried to convince the world he was a serious journalist. One doesn't become an accepted member of the Fourth Estate just because one begins wearing eyeglasses. The story of Katie is far from over. But, sadly, I see her ending up as Lee did at Appomattox: surrounded by younger, better-equipped foes with more ammunition. Katie is a one-trick pony. And, neither Katie nor the South will ever rise again. “Spam handling” the new pan handling? 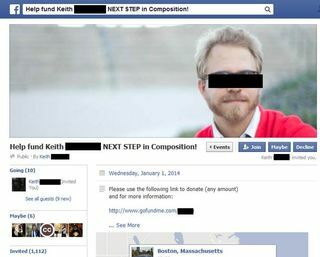 A friend’s adult son is apparently going after his third advanced degree in music composition, and I, along with 1,112 of his other closest friends, have been invited to help pay his way. I hardly know where to start with this one, but that as an educated adult he has no compunction to begging is as good a place as any. I mean, this is not to help his favorite charity. Wait a minute. Maybe he IS his own favorite charity. Is he such an artist that a mainstream job is too dangerous? If he was a waiter, some aggrieved customer might stab his magic fingers with a fork. His virtual tin cup is part of GoFundMe (“The easy way to raise money online.”) And he is just one of thousands who have set up sites to pay for such things as a honeymoon (“We’re thinking of sailing in the Caribbean!”) a dirt bike (”…cuz, honestly, that's about all I want.) or bankroll a Miss Teen USA hopeful (“Singing lessons are expensive!”). Of course there are the heart-tugging pleas from cancer patients and those who lost homes to natural disasters. Maybe. This mainstream solicitation portal dilutes everything to the point that you wonder just how many doe-eyed children are really sick. Or it could be just sick parents trying to make an easy buck. Ever since the United Way scandal (Millennials: look it up) charities have suffered mightily. And today, while things are better, thanks to such watchdog organizations as Charity Navigator, non-profits still have an uphill battle for the public’s dwindling discretionary dollars. And vehicles such as GoFundMe aren’t helping.